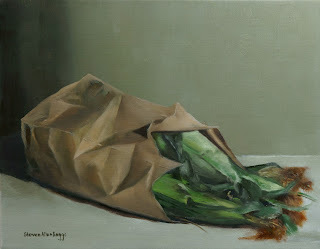 This is a brown paper bag with Peaches And Cream corn in the husk. This painting was about the contrast of the man-made paper with its lines, grooves, and angles,and the natural rounded and abstract shapes of the corn. I hope that you enjoy the painting!